Chakra stones pendant. 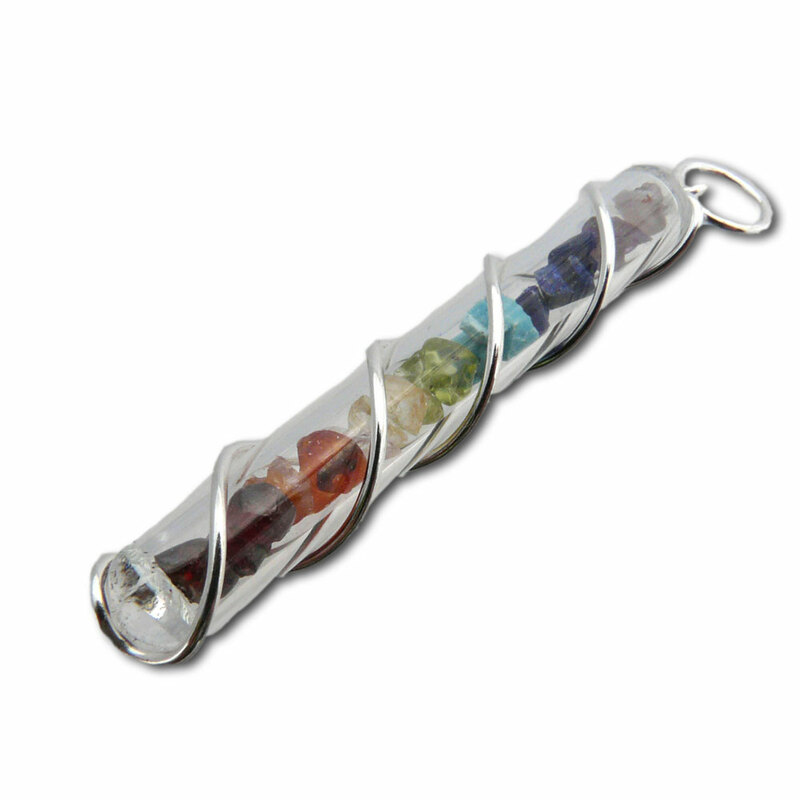 Semi-precious stone chips corresponding to each of the seven chakras are layered in a glass tube and wrapped with a sterling silver wire. Gemstone chips: garnet (red), carnelian (orange), citrine (yellow), peridot (green), turquoise, lapis (blue) and amethyst (purple). Chain sold separately. Each of the seven chakras has different properties and corresponds to a different mantra, color, stone and shape. Sterling silver. Made in Thailand. Ideal for necklace, bracelet or anklet. Microfiber suede is Vegetarian!Red, orange, yellow, green, turquoise, blue, purple and black. Add a whole new look to our pendants with some extra COLOR. The colors complement our stone pendants and add color to the silver ones. You can use them with any of our pendants and tie them to whatever length you want. You can choose between the anklet/bracelet size (approx 40 cm) or the necklace size (approx 90 cm). They are tie-to-fit.